What does it mean to be a confessional church? When making our case for a particular doctrine, is it fine to reference our confession of faith, or would it be best to just stick to Scripture? Isn’t the Bible enough for Christians in establishing our doctrine and practice? Should we demand church members subscribe to a particular view of a third-level doctrine? These are among the practical questions that sit at the heart of confessional Christianity. I put these questions to Ligon Duncan, a longtime confessional Christian and TGC Council member. Duncan, former pastor of the historic First Presbyterian Church in Jackson, Mississippi, now serves as chancellor of Reformed Theological Seminary. Is it biblical for the church to write and use confessions of faith? Yes! It is absolutely biblical for a church to use a confession of faith. The famous shema of Deuteronomy 6:4—“Hear, O Israel: the LORD your God, the LORD is one”—is a confession of faith. It affirms the two ideas most basic to the Israel’s religion: that Yahweh exists, and that he is the one true God. In the New Testament, Paul calls these fundamental affirmations “trustworthy sayings.” Such basic statements highlighting the fundamental commitments of God’s people are found throughout Scripture. What about writing confessions of faith? Again, yes. If you look at the history of creeds and confessions, you’ll see that human-created creeds and confessions arose out of the church’s desire to be faithful to Scripture’s clear teaching. Whenever false teachers were appealing to the Bible and twisting it to suit their own purposes, Christians defended the truth by clearly articulating their scriptural convictions with the most faithful language they could muster—and which the false teachers could not affirm. For instance, the word homoousios is not found in Scripture, but is designed to convey an indisputably scriptural idea about the deity of Christ and the consubstantiation of the Son with the Father. Arius and his company were unwilling to affirm it, and therefore that word was used to uphold biblical truth against heresy. HANS: We’re studying the Westminster Confession of Faith. Want to join us? FRANZ: No; I don’t give heed to the words of men like you do. F: I go by the Bible. I can’t rely on the words of mere uninspired men. H: Me, too. That’s why we’re studying the Confession. You should join us; it’d be very edifying. F: Wait a minute. I just told you that I only go by the Bible, and yet you have just equated the study of this Westminster Confession with a study of the Scriptures! H: And as I just said, I only go by the Bible, too. So, I’m not going to pay any attention to what you’ve just said. You’re not inspired, after all. F: Of course I’m not inspired; but what I said was right because it was BIBLICAL. H: How could it be biblical if it was merely what you — an uninspired man — told me? I only listen to the inspired words of the Bible. Isn’t it lording it over my conscience to tell me to accept your uninspired words as though they were the very inspired words of God? F: Oh, come on. I may not have quoted chapter and verse, but I was telling you what the Bible MEANS. That’s why you have to pay attention to it. H: Are you saying the meaning of the Bible, even if explained in the uninspired words of uninspired men, is still binding — in fact, as binding as the very words written in the Bible? F: Well, yes, that is what I’m saying. The meaning of the Bible, though stated in different words, has the same authority as the exact words found there. And since I’m telling you that the meaning of the Bible is not to give heed to the uninspired words of men, you still have to receive it as though those exact words I’ve spoken were written in the pages of Scripture. H: Wait a minute. How is what you’ve just said any different from the Westminster Confession? After all, the writers of the Confession were only putting forth what they thought was the meaning of the Bible. F: Well, er. . . umm. . . .
H: I know of one difference: they were all preeminently qualified to expound the Word of God. They were recognized as having these gifts by the various churches that delegated them to sit at the Westminster Assembly. Any scholar who knows anything about Protestant history knows that these men were the “cream of the crop”, and that almost certainly there has never been since that time (and maybe even up to that time, except for the apostles themselves) one body containing so many godly and learned men. I don’t think you possess the same qualifications, at least not yet. And, just because these men lived in the past doesn’t mean that they’re not a gift from God to us today. The Bible everywhere speaks of the church as one body throughout all history (Gal. 3:23-24; 4:1-3; Ps. 66:6; Hos. 12:4; Deut. 5:2-3). Therefore, the astute teachers of the past are our teachers as well, thanks to God’s gracious preservation of their writings. Actually, because these men were on the crest of the waves of reformation, and not in the trough of apostasy as we are today, we ought to pay more attention to them than to contemporary teachers. This is because all of us — including our teachers — have been blinded by our cult ure’s wretched and extreme departure from the Lord Jesus Christ. F: What time did you say you were meeting? I believe the meaning of Scripture requires that I attend! My note: I hold to the 1677/89 London Baptist Confession of Faith, but I believe that this illustration makes a good point. It shows the logical necessity of holding to creeds and confessions. For twenty years, I have considered myself a “confessional Christian.” That means I subscribe to a historic confession of faith that I believe beautifully and accurately summarizes the Christian faith. This doesn’t surprise people who know me. I tend to wear my convictions on my sleeve. Literally. The tattoos that cover my chest and arms speak to the faith I hold dear. 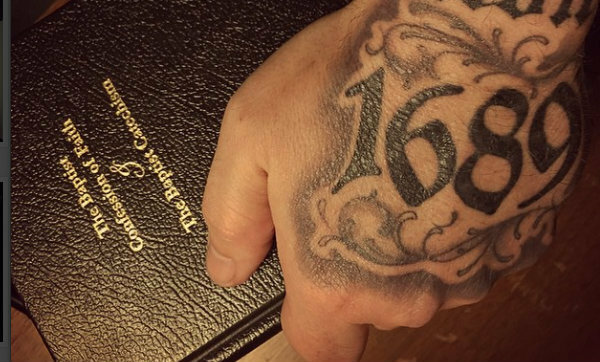 The tattoo on my hand reads “1689” for the 1689 Baptist Confession of Faith.